My server is in the shop still, so to distribute the practice CAT on the students’ computers, I had to walk from machine to machine with a memory stick, copying the file to each individually. While I was doing that, I said to my year 12s, “I’m not sure how many classes we’ll have between now and the CAT on May 8, so we may need to have classes afterschool or on Saturdays.” Having class outside the regular time isn’t unheard of, but I still was surprised with the student response. “Saturday!” They called. 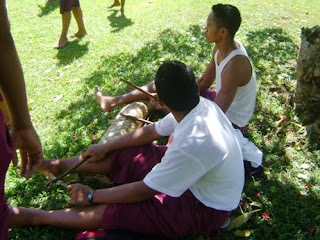 I was still contemplating their reaction afterschool when I was with the boys from the Savai’I house who were practicing for Culture Day, which is coming up on May 6. And there was my answer. The kids preferred having class on Saturday to missing Culture Day practice. The upcoming CAT focuses on Microsoft Word. I admit I hadn’t even looked at a sample of a past CAT until this afternoon when the students opened the file I had distributed. The directions ask students to type out a couple paragraphs of text and then format specific parts accordingly. Among other tasks, they have to bold words, right-align parts, and insert a table into the document. This wouldn’t be so hard if we’d had time to practice this stuff, but with nearly a week off for Easter and interrupting the Microsoft Word unit to practice for the last CAT, there’s been little time for practice. On the other hand, this is exactly the problem-based teaching that I was trying to do a couple weeks back that never really took off. So I think if we have the next 2.5 weeks to practice, I should be able to get them in shape before the big test on May 8— if I can find time between Culture Day rehearsals. Growing up in the cultural melting pot of the East Bay, we had lots and lots of cultural assemblies, but when it comes to celebrating a single, unifying cultural background, I have nothing in my experience to compare to. I’m not saying this is necessarily a bad thing. I like being the product of a muddled place where we clung to the mantra that “Diversity is our strength, unity it our goal.” It’s hard to think of other places in the world that offer the breadth of cultural literacy that came with growing up in Union City. Or in the United States in general, for that matter. But I have no frame of reference for cultural pride. I don’t mean to say that I’m not proud of where I come from. But still, being of Portuguese/Irish ancestry, I can’t get nearly as excited as my students here when it comes to attending a Festa, and I can’t stand Celtic dancing. But the kids here cannot get enough of preparing for Culture day. They love it, and they take it very seriously. Seriously enough they’d rather come in on a Saturday than miss practice on a weekday afternoon. I hope you’re avoiding Celtic dancing. Pictures below. One of my students, Pene (short for Penetekoso) in the wife-beater. He's kind of the equivalent of 2nd chair percussion. The kid in the white shirt is 3rd chair. Rehearsal happens all over the place, so it's not all that important who you're standing next to. Or whether or not lines are straight. E vevela le la. The sun is hot. Everyone crowded into the shade during a break in rehearsal. Hey Matt, just catching up on your last couple weeks of blogs. I enjoyed the tattoo one and the one with Akanese. She is such a beautiful kid. I'm excited to see the Cultural Day. I'm wondering if you can upload some video or does that take too much memory? I'm not sure how that works. anyway, from your last post, IMO i'd hold off on the dog at least for a little while. i've always pictured dogs like another child... another responsibility to be tethered to. Papa would be so sad to read your comments after all the times he tried to share his love for "Riverdance" with you! And think of Ryan W. and the sopas. Chicago Irish Dance is the best!! !